Ascending Butterfly: Spring Into Bags Special Feature - Enter to win an Elliott Lucca Designer Bag! 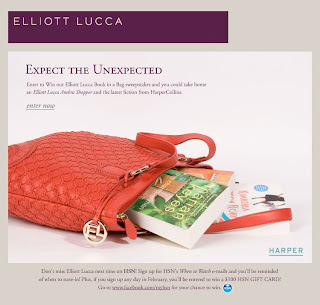 Spring Into Bags Special Feature - Enter to win an Elliott Lucca Designer Bag! This giveaway is now CLOSED. Thanks so much to our wonderful sponsor Elliott Lucca, We look forward to working with you again! The winner is 'cdziuba' Remember: There are still some great giveaways active on the upper right hand side of the page! I was so excited about our new 'Spring Into Bags' special feature, I have decided to launch it one week earlier than expected! This feature was set to go live in March, but I just couldn't wait to share with you one of my favorite joys of Spring, new handbags! This Spring, color will be hot in handbags (think 'brights' like yellows, kelly greens etc) and studded bags in honor of the 'Rocker Chick' inspired runway looks we saw at New York Fashion Week. We all know the best way to apply runway style trends to our day to day lives lies in the accessories. None of us can show up at work with a head-to-toe look straight off the runway, but we can rock a great bag! For Spring 2010, Ascending Butterfly will be hosting a special feature called 'Spring Into Bags' we are going to be reviewing and giving away hot handbags from hot bag designers! Fasten your seatbelts fellow bag lovers you are in for an awesome ride! The first designer being featured is Elliott Lucca who has been spotted on the arms of celebs like Jennifer Garner and Carmen Electra. I was sent Elliot Lucca's "Casares Bag" in the 'Curry' Color, it's major Spring Arm Candy with it's basketweave design from the base to the middle and the drawstring with the metalic pull stop and side pockets with branded zipper pulls that have a leather tassle accent. It's buttery soft. There is nothing like the smell of leather in the morning! How would you like to become a 'bag reviewer'? The winner of this giveaway will win a different bag than the one I reviewed. We'd love to hear the winner's feedback on their bag once they have had some time to test drive it in the spring! Adjustable and removable strap; can be worn as a crossbody or clutch! How to Win: (1) You must be a PUBLIC follower of Ascending Butterfly to be eligible for this and all giveaways. Indicate in your entry that you follow (if your 'comment name/user id' differs from your profile id, please let me know what name you follow under) and (2) Visit Elliott Lucca and pick another bag (other than the one being reviewed and the one being given away!) that you like and leave the LINK to that bag in your comment entry! (3) You must also leave your email address somewhere in your comment. (You can format it this way for security, example: ascendingbutterfly AT mail host DOT com). Please follow the easy 1, 2, 3 steps to winning! This giveaway is open to USA residents who are 18 years of age or older. IMPORTANT: Your email will be shared with the sponsor of this giveaway, your entry is your permission for us to do so. As a result, your email MUST be included in your entry! Ƹ̵̡Ӝ̵̨̄Ʒ -To welcome our new fans to Facebook we are offering 20% off www.elliottlucca.com until 3/9. Please friend us on Facebook to receive the promo code! 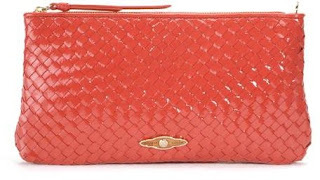 I love the Padova Draw Tote in Poppy! I follow Elliott Lucca on twitter as nina0205. I voted fro you on Fuel My Blog! I ADORE the Sintra Satchel in distressed gold! I love the Ambra Shopper. I follow you as katygmorris. Also, I'm in LOVE!!!! with their Valeras Double Handle Hobo! It's amazing! I follow Elliot Luca on Twitter as katygmorris. I Dugg this article as katygmorris. I faved this on Technorati as katygmorris. I voted for you on Bloggers Choice Awards as katygmorris. in downtown Baltimore at Lexington Market, I purchased a bag almost like this for 30.00 bucks. There is a kiosk for handbags and they are nice but they're just not the real deal. Follow Elliott Lucca on twitter. I am a follower. My favorite Elliott Lucca is the Valeras Double Handle Hobo. 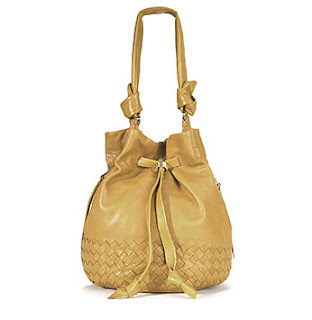 and I'd love this bag: http://www.elliottlucca.com/Ambra_Hobo/pd/np/100/p/1105.html The Ambra Hobo in Saffron. I like the Zooey drawstring bag a lot. nice shimmer! I like the Napoli Draw Tote. I follow and like the Napoli Crossbody too. I follow. I like the Ambra Hobo. My email is in my google profile. I would prefer not to post it publicly when it is easily accesible. I'm a follower. I like the Oden Drawstring Tote in Seafoam. I am following you thru Google Friend Connect. I like the Maxfield Drawstring in black-- super cute. My email is spaznchick at gmail dot com. Another bag I really like is the Valeras Drawstring bag! !